The Insofast 18 range, which now comes in 4 lengths, has an 18mm dome-strengthened head and a helical shank. 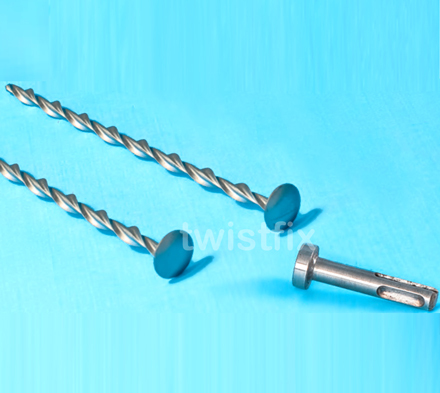 When hammer driven the fastener corkscrews through the insulated plywood or OSB composite and into the joists. The 220mm fixing is only available in stainless steel, which offers a 80% reduction in cold bridging, compared to zinc plated Suretwist fixings due to a CSA measuring just 9mm2 and due to stainless steel being 4 times less conductive than galvanized carbon steel. Additionally stainless insulation fasteners offer vastly superior protection against the corrosion potential of interstitial condensation. Insofast 18 flat roof insulation fasteners are installed at fixing centres of 600 x 400, offering a further 18% saving in nailing and cold bridging potential. For more information contact us 0845 1236007 or email info@twistfix.co.uk.